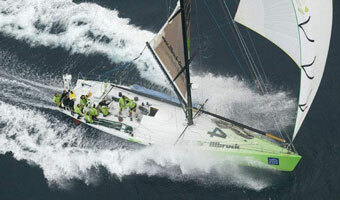 The Illbruck challenge boat was designed by Bruce Farr, this hull won the 2001-2002 Volvo Round the World Race edition. Until November 2005 the boat mantained the world 24h monohull speed record, covering 475 nm with a 19.9 kt medium speed. The model was designed using the original design sketches find on Farr site and a big photopack. Using a lot of material i was able to reproduce the real one bulb design with a particular triangular section. This was tried in a numerical fluid dynamics program. This program, used in my engineering department, shows its eventual validity for the use on a rc model boat. I thank Federico for the page he give me on his site.